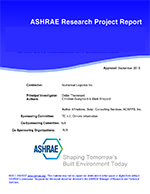 This standard is based, to a large extent, upon ANSI/ ASHRAE Standard 94-77, "Methods of Testing Thermal Storage Devices Based on Thermal Performance." Originally it had been planned to publish Standard 94.2 as an additional section to Standard 94-77. As the Standard Project Committee's work progressed, however, it became apparent that the differences between the two standards would be larger than had been originally assumed. In order to facilitate the use of the standard, it was therefore decided to issue it as a separate document. Numerous provisions in this standard are identical to those of Standard 94-77, particularly Sections 4 and 5 and Subsections 6.1 through 6.5. Figures 2 and 4 were also taken from that standard without change; other figures were used with minor changes. The financial contribution of the U.S. Department of Energy, which paid for the travel expenses of some of the Project Committee members in order to accelerate the preparation of this standard, is gratefully acknowledged.